The main challenge every blockchain product faces is eventual adoption and distant use-case behind, believes Jian Kai (Jake) Goh, Co-Founder, CEO at Rate. 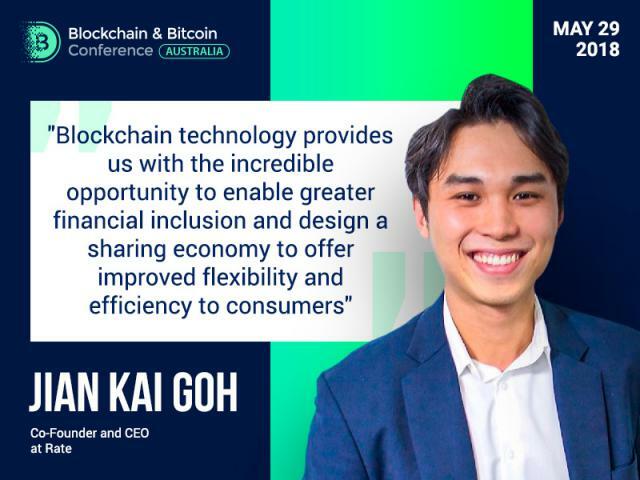 Jian Kai (Jake) Goh is the expert in finance and technology. He will take part in the panel discussion “ICOs: Opportunity or Threat?” at the Blockchain & Bitcoin Conference Australia on May 29. In the interview, Jian Kai (Jake) Goh discussed Rate3 development, legal challenges and global economy. BCA: What is the main driver for the Rate3 development? JKG: We see several key problems we did while developing an e-commerce base. They include high fees, poor exchange conversion rate, chargeback risk from merchants, problems with cashback, challenges with obtaining credit for both merchants and consumers. So, with the right application of blockchain technologies, we have solved these challenges. BCA: What is the peculiarity of the Rate3 payment protocol? JKG: Rate3 is a decentralized tool protocol for payment and credit. So, one most particular point about Rate3 is that we are not just based on one blockchain. We deploy cross-chain architecture that allows us to deploy the RTE token on any blockchain that can meet our needs. So, for payment we have developed Stellar network, for credit score we are using Ethereum to do smart loan contracts. BCA: What advantages does it provide to users? Who will benefit when using Rate3? JKG: The RTE token is a medium of exchange so eventually a store of value. Actually, it has been devised for participants in an ecosystem to conduct actions as we need. So, for consumer, we are talking about cashback, for merchants – instance settlements, no chargeback, only the fact that they have to pay a very small amount of fee. A borrower will get the discount in the form of RTE if they fulfill the free proof that we need. And for lenders, black form for you will be taken when the smart loan contract is being done on our platform. For the back developers, they are users of free protocols. They will be rewarded with the tokens for building apps that benefit the ecosystem. BCA: At what stage is the preparation for Rate3 ICO? Which challenges are you facing? JKG: We have concluded out token sale and right now we are in preparation for launching of one of our projects this year, also on exchanges. I think that the main challenge every blockchain product faces is eventual adoption and distant use-case behind. How do you actually find early adopters to start using our protocol? In our case, we sought these for two weeks. One, using cross-border protocol and tapping on our existing distance. Compared to competing projects, we have another scheme of payment and incomes. Rigex, the Swiss e-company that we founded in 2016, they transact over three million dollars and they have more than eight thousand daily active users for now. Our mobile app RateS is a first step to adopt our protocol. Eventually, our main app will facilitate credit and lending between merchants that are working with us and consumers that are already using our app. BCA: What legal problems did you face at the design and planning stages? What legal pitfalls are there and how can they be overcome? JKG: Legal challenges is a huge problem. At a design and planning stage, we work very closely with corporate lawyers to design a new legal structure and all relevant activities such as KYC (know your customer) and the anti-money laundering law. I think the most important takeaway for us is to work really closely with trusted lawyers who have had past experience with other ICO. BCA: In which countries will it be possible to use Rate3? What does the expansion of the project depend on? JKG: What we are looking on is a global perspective. It will be open source so any developers in any country can work with Rate3. Right now, we are able to support twelve currencies and in the future, all currencies. Extension of our project really depends on the payment the users work with. We will be looking very closely with standard to create more liquidity on the number of transferred fiat we are currently able to adopt. BCA: How will such payment systems as Rate3 affect the global economy? JKG: We’ve made it easy for anyone to send and receive cross-border payment, be you a consumer of a business use-case. And the credit profile that you’ve built with us will also be cross-border. It will be universal and acknowledged in any part of the world, very much like how blockchain intends to disrupt the current situation for the treasure and financial infrastructure space. If you look at RDP that was founded 1999, they believe that the Internet will be leveled to a plain field enabling e-commerce pieces to leverage innovation and technology. We believe that blockchain will gain it through decentralization by empowering every participant to reduce our reliance on traditional financial institution. Firstly, we start with payment and credit. We want to make free a protocol layer for future apps to be on in terms of advertising, insurance, stable coin as exchanges, and RateX and RateS will be the first apps to adopt the first cross-border e-commerce piece.